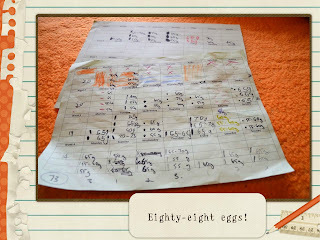 Hamby Home(in)stead ...: Eighty-eight eggs! It is 35 days since the chookies came to live with us - just over one tenth of a year. 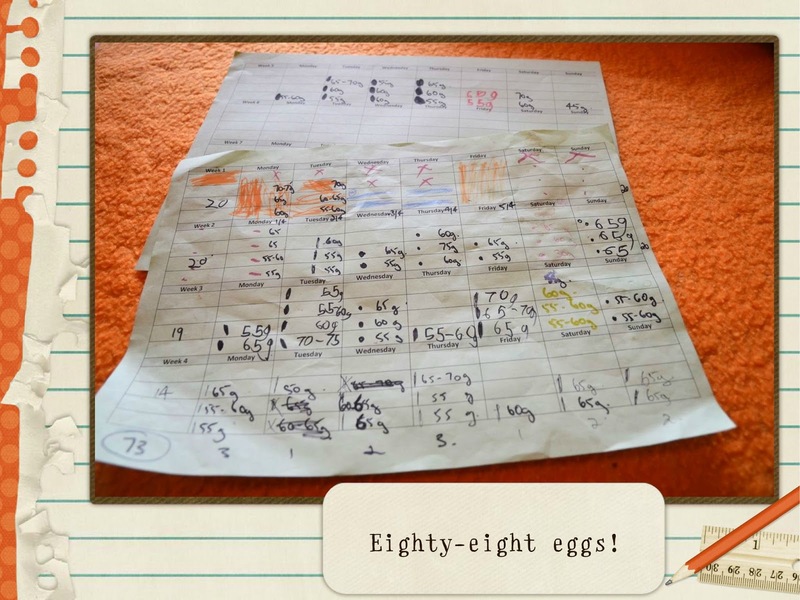 As you can see, we've been diligently charting their egg production. It's interesting to look back over the weeks. There has definitely been a slight drop in out-lay (hah!) since the weather cooled. When Vaughan was a much younger fellow he particularly liked the number 80. If he wanted to impress upon us an extra-large quantity he would repeat "eighty-eighty-eighty-eighty"! Against that family history, it's quite fitting that we celebrate the gift of our 88th egg (which also has some fabulous alliteration)! 88 eggs OR 5 family quiches, 3 sponge cakes and a couple of good sunday morning fry ups!! What good girls they are feeding you up AND getting the soil ready for some plantings!!! I've been meaning to take pics of the fry-ups. Our scrambled eggs (and this morning's frittata) are beautifully bright yellow - very pretty!